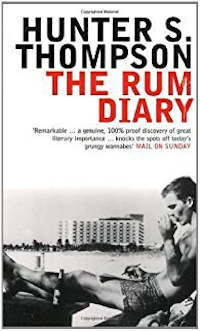 What better book to read on a long flight to the Caribbean to talk about cocktails, than gonzo journalist Hunter S. Thompson’s fictional account of a young reporter’s rum-fuelled experiences in 1950s San Juan, Puerto Rico? A longer book, that’s what. I’d read the whole thing and we’d barely cleared European airspace. But it was a great way to get into the spirit of Puerto Rico. The Rum Diary manuscript lay unpublished until Johnny Depp came along and, er , discovered it. And then played the lead character in the film adaptation. I haven’t seen the film, but the trailer suggests that it’s not a line-by-line retelling of the story. I don’t think I’ll watch it.